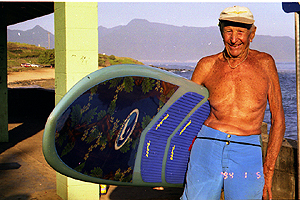 "Of Wind and Waves: The Life of Woody Brown"
The Orange County, CA premiere wason Thursday, March 8th, 2007. at the Pierside Surf City 6 Theatres, 300 Pacific Coast Highway in Huntington Beach. A benefit for the Huntington Beach-Seal Beach chapter of Surfrider Foundation, the screening is the March feature of “Surf Theatre” sponsored by Big Red Productions. The Half Moon Bay premiere was on Friday, March 9th,2007. as part of the Coastside Film Society's monthly film series at the Community United Methodist Church, 777 Miramontes at Johnston. A $6 donation is requested. --Thursday, Aug. 3, 2006. McCoy Studio Theater, Maui Arts and Cultural Center. 1 Cameron Way. Kahului, Maui. Tickets $10 at the door, on sale starting 6:30 p.m. day of show. --Friday, Aug. 4, 2006. Private screening at Kuki'o, Big Island. Public admission: $50. --Saturday, Aug. 5, 2006. Aloha Theatre, 79-7384 Mamalahoa Hwy., Kainaliu, Big Island, near Kailua-Kona. Tickets: adults $7 , $6 seniors and children. --Sunday, Aug. 6, 2006. University of Hawaii, Spalding Auditorium, Honululu, Oahu. (Off University Ave. and Maile Way) Beyond Oil Film Series. $5 general, $3 students. Directions to Spalding Auditorium: Proceed north on University Avenue two stoplights past Dole St. (Maile Way). Make a right onto the campus. 400 yards past the guard gate, park in the lot on the right at the corner of Maile Way and Farrington Rd. Walk through passageway to the front of the building. The auditorium is on the first floor. --Monday, Aug. 7, 2006. Waimea Valley Audubon Center, Waimea Valley, directly across from Waimea Bay, North Shore Oahu. Admission $7. Bolinas Museum Film Series, February, 2007. Thursday, November 30, 2006 - Sunday, December 3, 2006. Tuesday, December 5, 2006 - Thursday, December 7, 2006. Rio Theatre in Santa Cruz, 1205 Soquel Ave. Hot Springs Documentary Film Festival. Hot Springs, Arkansas. Larkspur Cafe Theatre. 500 Magnolia in Larkspur. Thursday, Aug. 3, 2006. McCoy Studio Theater, Maui Arts and Cultural Center. 1 Cameron Way. Kahului, Maui. Friday, Aug. 4, 2006. Private screening at Kuki'o, Big Island. Saturday, Aug. 5, 2006. Aloha Theatre, Big Island, near Kailua-Kona. Monday, Aug. 7. 2006. Waimea Valley Audubon Center, Waimea Valley, directly across from Waimea Bay, North Shore Oahu. Tuesday, Aug. 8, 2006. Grand Hyatt Kauai Resort, Grand Ballroom, Poipu, Kauai. Kauai Health Guide Film Festival.